Eddie Martin, the Jiveoholics and the Numbers Racket are among the stars of the first ever jazz festival in the Carmarthenshire town of Llandeilo from Friday 6 to Sunday 8 July 2012. Three local pubs - the White Horse, the Cawdor and the Angel - are the venues taking part in the event sponsored by the Evan-Evans Brewery which includes a Sunday afternoon concert in Penlan Park. 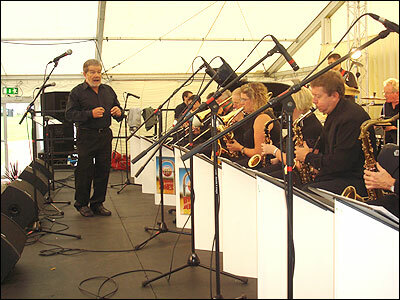 Musical styles range from traditional to contemporary jazz, gypsy, ragtime, blues, soul and jive. See www.jazzatllandeilo.co.uk for full details. The Osian Roberts/Steve Fishwick Quintet fly the flag for Wales at the 2012 Rochester International Jazz Festival in the USA later this month. They're one of the feature acts in the Made In The UK series of concerts, funded by Arts Council England and Creative Scotland, and organised by ESIP in association with Jazz Services UK. Get the Blessing, Liane Carroll, Breach, Fraser Fifield, NeWt, Mark McKnight, the Orlando Le Fleming Trio and Arun Ghosh also appear in the concerts at the Christ Church Rochester in New York state from 22 to 30 June. Osian, Steve and the band appear on 27 June. See www.rochesterjazz.com for more details. A programme of 22 concerts has been unveiled for a new look Brecon Jazz Festival running from 10 to 12 August 2012. Roy Ayers, Dionne Warwick and Ginger Baker are among the big names signed up within a matter of weeks after Cardiff-based promoters Orchard were given the job of staging this year's festival. Claire Martin, Neil Cowley, Lighthouse, Soweto Kinch, and a tribute to Thelonious Monk by Stan Tracey and Bobby Wellins are also included in a line-up put together with advice from artist-in-residence Huw Warren. Orchard director Pablo Janczur said: "We aimed to recover the Mojo that people feel Brecon has lost in recent years, and hopefully we've put together a bill that is attractive to both a local audience in Wales and to the legions of travelling fans who have made Brecon Jazz such a special, and economically beneficial event over the years. "Given the time constraints, 2012 was always going to be an interim year, but we have well over 20 gigs in the classic Brecon town venues, with colour and atmosphere returning to the streets of this beautiful part of Wales." Venues include Theatr Brycheiniog, the Market Hall and the Guildhall, with workshops at Christ College. See breconjazz.com for the full line up and the BBC News website for more about the festival. Meanwhile the Brecon Fringe will start on Thursday 9 August 2012 offering hundreds of gigs at more than 30 pubs and clubs around the town - see www.breconfringe.co.uk for details. Rhys Phillips pays tribute to jazz big band leader Byron Jones following his death with a special radio programme. He recorded an interview with the trombonist from Ystrad Mynach a few weeks ago in front of a live audience from the South Wales Big Band Society at Whiteheads Sports and Social club in Newport. It was broadcast as part of Rhys' Jazz Special on Radio Cardiff as planned on Sunday 3 June 2012, at the request of Byron's family.